Are you confused about what SEM and SEO are? Never even heard of SMM? Let’s talk. Now is a good a time as any to give you the bare bones about digital marketing in it’s current shape. Touted as the journey of optimising a website through a variety of ways, ideally this journey leads to rankings. Each site is ranked according to presence. A number of factors can both negatively and positively affect ranking, but a high ranking means that you’ll show up early ( very early, if done well) on the first pages of a Search Engine like Google. And of course, you want to be high up on that menu, rather than hidden in Google’s bowels, which is where you’ll almost certainly be if you avoid optimisation of any kind. Back to the ways you can improve where you appear on a search engine. First up, you’d need to find out more about what your customers are looking for when they search for the product or service you sell. For example, let’s say you sell high-end exercise equipment online. Putting yourself in the shoes of your target isn’t just useful- it’s essential if you want to understand the most effective way to reach an audience. You would perhaps search for “Quality barbells online,” agreed? Think about the phrases and ideas that would spring to mind in your target market’s head when they search for what you’re selling. THEN, it’s time to start considering content. Unique. New. Regular. Content is only relevant if it is well written and ticks a whole bunch of optimisation boxes. You can’t re-use it. You can’t re-word it. Check out the trending topics related to your products and work them in to any content you need to post. Content is a considered game, and it’s not just drivel at a keyboard. You can use both long tail and short tail keywords in your content for good results. Other factors like considered metadata and alt tags will place you at a better position with Google to be picked up and ranked favourably when it comes to SEO. Next up- SEM! What’s the difference and why will understanding it make you a better businessperson? 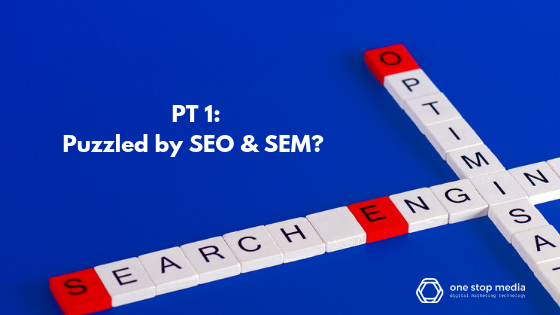 More in part 2 of this 3 part series on SEO, SEM and SMM terminology next week! Have you been running the business trying to figure out what’s actually behind the myriad of acronyms no-one seems to want to clarify? It’s easy to be overwhelmed with all the information out there, tools, platforms and more that are supposed to drive business progress- but there’s no need. If you have questions about which marketing methods are most appropriate for your business, contact the team at One Stop Media for a full break down on why and how the marketing packages we tailor for our clients are set up to help you win- with clarity.